This trip is world-class. 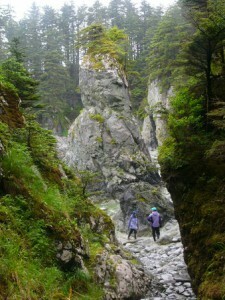 We begin in scenic Juneau at Auk Bay. Heading north, we pass through the spectacular whale rich waters around Pt. 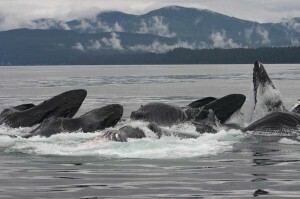 Retreat and Couverden Bay where humpback whales congregate each year to feed on herring, krill, and other tasty fishes. They have learned a behavior that you won’t see anywhere but Alaska called “bubble-netting” where they encircle schools of prey using a ring of air bubbles. Coordinating together, they then rush upwards through the column of bubbles with mouths gaping wide, they explode upon the surface of the sea as a group, gasping and bugling and celebrating full bellies. This is one of the most astounding spectacles in nature, and we hope we can show it to you. 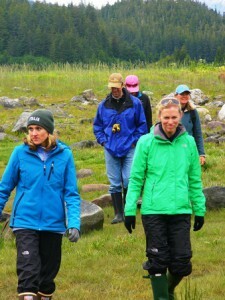 After we’ve rounded Pt Retreat, we’ll head to Funter Bay, an important place in the history of Alaska. Home to a former salmon cannery and gold mine, it was all but abandoned in WWII. The US Armed Forces chose to resettle hundreds of Aleut Natives from the Aleutian Islands as the Japanese attacked the area. Sadly, they were ill prepared for the squalid bleak surroundings in an environment they had never experienced. The bay is home to a somber cemetery of nearly forgotten graves. 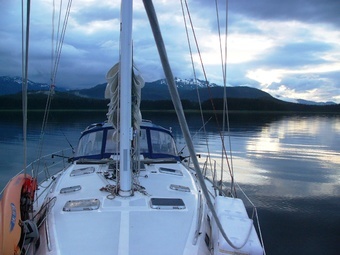 The open, but protected waters of Icy Strait are often excellent for sailing. We’ll put the sails up and enjoy the distant whale sounds and the quiet of Alaska. Off Pt Adolphus, we’ll stop to watch the sealions, though we’re never sure who is watching who. They often cavort nearby for some nice photos. 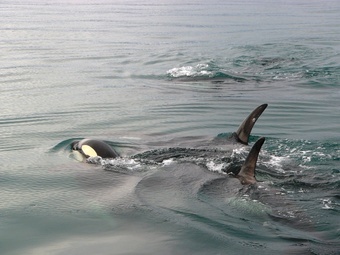 Last season we were approached by a lively pod of killer whales with an “adopted” baby harbor porpoise. Wonders never cease in this part of the world. We find several excellent beach walks along the way to stretch the legs, and several nice streams to cast a fly and watch bears. 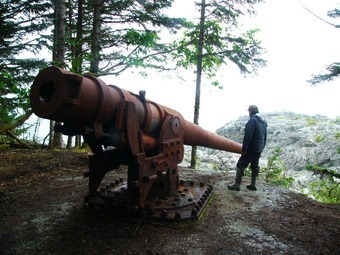 Near Elfin Cove are the ruins of several abandoned WWII gun emplacements and other fortifications. We love to stop and explore them. In wee Elfin Cove (even the name is quaint) we stopped for the 4th of July festivities. It’s a fun place and we were welcomed with a pancake breakfast, and enjoyed the micro-parade. 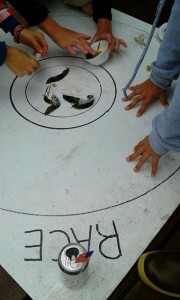 The chili cook off kept us well-fed, and the events (including slug races) kept us laughing. It’s a really nice town. Elfin Cove is our turnaround spot, and at this point we had 3 more days to kayak, watch whales, fish, explore, and enjoy the many wonders of Southeast Alaska. 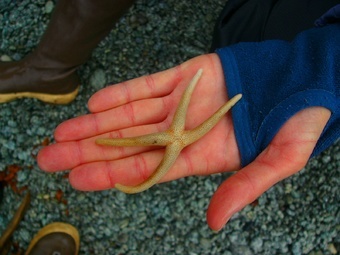 The trip reluctantly has to end, but more adventure awaits in Juneau.